Who is the 2018 Coalitions & Alliances Giving Project in Portland? The 2018 Coalitions & Alliances Giving Project consists of community members from across the Portland metro area. Among us are activists and parents, vegans and techies, transit riders and dog-lovers, teachers and learners. We bring our strength, passion, and resilience to collectively move resources towards social justice. Raising at least $130,000 from the community, including making a meaningful donation of our own. Redistributing these funds as grants of at least $20,000 to grassroots coalitions and alliances. Engaging our communities in a dialogue about movement-building and social change. We will rely on each other and the community we are building because we firmly believe social justice cannot be tackled by one individual. It requires our collective effort. Why coalitions and alliances? Why now? This current political moment is driven by division. By funding progressive coalitions, we refuse to accept this. We are stronger together. This grant cycle will fund organizing at the intersection of issues, focusing on collaborative, diverse, and community-driven solutions to injustice. These one-year general operating grants will support social justice organizations working together around our five-state region: Idaho, Montana, Oregon, Washington, and Wyoming. To find out more about the types of work our grants will support, please see this list of previous Social Justice Fund grantees. You can support the project by making a gift to help fund coalition and alliance-based social justice work in our region. The deadline to donate is August 15th, 2018! Go HERE to donate and put “CAGP PDX” in the comments box. If you were asked by a giving project member, please don’t forget to include their name in the comments field as well. 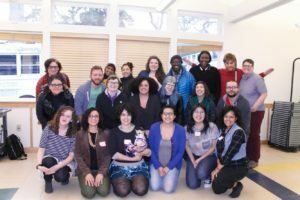 Contributions to Social Justice Fund’s 2018 Coalitions & Alliances Giving Project in Portland are tax deductible. We also accept donations by check, stock, donor advised funds, and planned giving. Please go here for more information on how to give.